Welcome, Simon — Paolo M. Mottola Jr.
Cosmo was a bust. Mom returned him and decided to drop the "oodle" from the Schnoodle equation. Say "hi" to Simon. 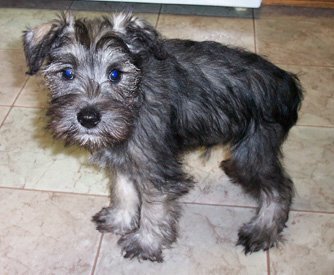 He's a Miniature Schnauzer hailing from Olympia, Wash. He's nine weeks old, weighs approximately 5 pounds and has already grown a mustache.